Founded in 1949, Sandia National Laboratories, located in New Mexico (with additional laboratory facilities in California and Hawaii), is a government-owned facility managed by Lockheed Martin corporation for the Department of Energy (DOE). Sandia was originally managed by AT&T, but in 1993 Lockheed Martin assumed managerial control. Sandia scientists and engineers participate in projects and programs designed to ensure the safety of the U.S. nuclear stockpile and maintain a high level of reliability in aging weapons. Increasingly key to safeguarding the nuclear stockpile is the development of high-speed virtual simulation capabilities that are able to model the complexities of the changes in weapons material as a function of time. Sandia programs also support the development of technologies and protocols that facilitate nonproliferation and secure control of nuclear materials (e.g., enhance weapon and surveillance technologies). Specific programs to enhance offsite monitoring include the advancement of robotics systems capable of monitoring proliferation activities. Sandia supports programs seeking to assist Russia to safely manage and control nuclear materials from dismantled Soviet-era weapons systems. Other less direct, but equally emphasized programs, are designed to enhance U.S. national security by developing technologies to protect critical infrastructure—especially energy production and delivery infrastructure. A specific aim of current Sandia projects involves potential integration of pulsed power technologies into defense-related applications. Other programs related to infrastructure protection are dedicated to extending the protection levels of radiation-hardened microelectronics. In an effort to combat emerging threats, Sandia scientists and engineers are tasked with anticipating the need for new defense options and for developing technology capable of identifying (and neutralizing) biological and chemical agents. One Sandia innovation, "Amazing foam," is a nonhazardous decontaminating foam capable of rapidly neutralizing both chemical and biological agents. Another Sandia innovation, the "magic cube," is capable of shaping a blast that blows a fragment-free hole in steel. Such developments have broad application. Magic cubes can be used to enhance low-invasive inspection of steel encased materials or to blow a hole in steel beams obstructing rescuers attempting to search through rubble or reach victims of a building collapse. Sandia also devotes research resources to advancing techniques involved with hazardous material clean-up and the safe decommissioning and dismantling of obsolete weapons. Scientists at Sandia National Laboratories California collaborated with researchers at Lawrence Berkeley National Laboratory and Lawrence Livermore National Laboratory on the development of environmental remediation technologies useful in the cleanup of military disposal sites (e.g., the nearby Alameda Naval Air Station). Sandia's technology transfer programs (where facets of defense related research are released and shared with private industry) are designed to increase United States' global economic competitiveness. The transfer is a bilateral arrangement that also allows industry input in defense design schemes. Other public programs sponsored by Sandia include educational outreach programs designed to foster excellence in scientific curricula and teaching. Sandia scientists and engineers are highly involved in nuclear weapons production. Sandia designs and engineering integration impact and more than 6,300 parts of the estimated 6,500 components of modern nuclear weapons. Other programs designed to enhance national security includse highly specialized and sophisticated modeling and testing facilities that allow Sandia scientists to test updates to weapons systems without actual nuclear testing. Failsafe technologies—devoted to preventing accidental nuclear detonation—include sophisticated arming and firing systems (e.g., the MC2912 arming system utilized on the W76/Mk4 nuclear warhead). Sandia's sensory technology programs are designed to detect nuclear materials as well as chemical and biological weapons agents. 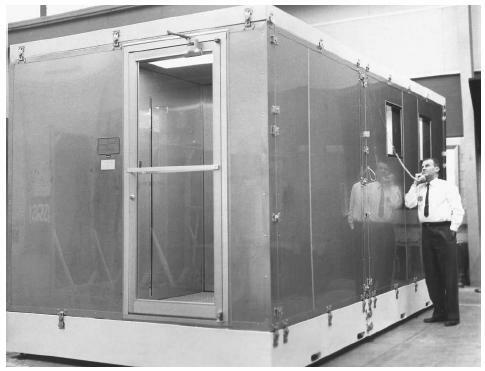 A Sandia National Laboratories researcher speaks by phone with someone inside an early model of the ultra-clean room invented in 1962. Sandia is also responsible for about 98 percent of the 6,000 non-nuclear parts in nuclear weapons. military disposal sites (e.g., the nearby Alameda Naval Air Station). In April 2003, Sandia scientists reported that they had achieved controlled thermonuclear fusion in a pulsed power source. If ultimately reproduced and verified, the process, and other competing approaches to controlled fusion, holds the promise of nearly unlimited clean power generation. Unlike fission reactions, fusion based energy technology would not produce long-lived radioactive waste. Instead of using magnetic containment to compress hydrogen and thereby achieve temperatures hot enough for fusion to occur, Sandia scientists used pulsed releases of current to achieve a rapid series of limited micro fusion reactions. Using an improved and more powerful Z accelerator, high current is induced in a tungsten wire cage surrounding a 2 mm plastic capsule containing deuterium (a heavier isotope of hydrogen). The tungsten cage is vaporized, but the short-lived current impulse generated in the wires creates a powerful magnetic pulse and shock-wave of superheated tungsten that creates an intense x-ray source that, along with the shockwave compresses and heats the hydrogen to more than 20 million degrees Fahrenheit (more than 11 million degrees Celsius) to induce fusion. The Sandia reaction process contrasts with another promising approach undertaken at the Lawrence Livermore National Laboratory (LLNL) that seeks to initiate fusion reactions by shining high-energy lasers on hydrogen globules. The LLNL approach will be further explored at the National Ignition Facility.